She grew up in Saltney Ferry and recalls often staying at her dad’s sisters house in Ewart Street, which was a railway community. As a special treat she would catch the train to Liverpool with her parents to buy her winter coats “it was pounds, shillings and pence back then!” One of her earliest memories is a massive thunderstorm that left her stranded in Mr and Mrs Price’s post office. She recalls the excitement of the power cut and candles in the dark as the storm raged “it was the stuff of films” As soon as they could, her and her sister sprinted back to their house and their worried mother. The first step was a job in an office that supplied washing machine parts. Annie was enjoying her social life and was always tired in the day. “ We used to have a laugh and I used to catch up on my sleep dozing on top of a typewriter”. She left by mutual consent and got a job at Will R Rose photographic lab earning £9.02 a week. She recalls sexual harassment as being rife at the time. “there was a demonic lorry driver who always tried to corner me on the stairs”. She also recalls having forbidden glances at police and medical photographs that had come in to be developed. They were kept behind a door that was sometimes left unlocked and were of injuries and disturbing medical deformities. Still, she yearned for personal change and new opportunities, and she defied her families expectations of a job in the offices at the Steelworks and applied for a job in a bookmakers. It was an exciting time for Annie, she had a great boss named Steve and all of the customers and staff would socialize together. Over the years Annie worked here, up until 1996 Annie served many famous customers including Ryan Giggs, John Barnes and future Hollywood star Vinnie Jones. Ian Rush was a regular, Annie knew him from the clubs and he would often appear at the doorway with a cheery smile asking “are you coming for a bevy later?” She also met 80s comedian Duncan Norvelle- her manager discouraged her from asking the funny man to say his “chase me chase me” catchphrase. “In those days people were a lot more sociable with each other” Annie states. Corals hosted snooker tournaments at Pontins in Prestatyn and she saw many of the greats in action, such as John Virgo, Dennis Taylor and Alex Higgins. Aged 20, Annie went for an interview at Tiffany’s, a three storey nightclub situated at the far end of Foregate Street. “I always looked younger than my age and they were gonna kick me out when I got there. “ She had been visiting the club for a while as a customer and felt she might as well earn some money while enjoying the party atmosphere. “Tiffany’s was the place to be!” she smiles. She worked there 3 nights a week as a glass collector , after working 10-6 at Corals. She would go home to Saltney to get changed, then work from 8 til 2am. “ I was young and full of energy” she states. The club was alive with the sounds of the 70s, Abba, The Bee Gees etc, full of flashing disco lights and a 25ft fake tree with illuminated leaves on the ground floor. There was a bar downstairs and rooms for pool and the first arcade game, Space Invaders. The middle floor had a balcony looking down on the atrium and a cocktail bar run by a lady called Bridget- she dated doorman Trevor and they are still together over 30 years later. The top floor hosted another bar and a small restaurant with a temperamental chef. He would throw sausages around and exaggerate the size of the small burgers by overhanging them from the edge of the bun. Upstairs was the main dance floor with the infamous flashing dance floor made famous by John Travolta in Saturday night fever. Annie paints a picture of the world at play “in them days people didn’t have cameras or mobile phones, everyone was living for the moment, just having fun” During this period Annie first met Sue, who was to be her friend for over 30 years to the present day. They both lived in Saltney and would often sneak off to pubs and clubs together. She later came to work with Annie at Corals. She remembers wet T shirt night (women only) , and many fancy dress nights. “I remember Halloween, I drove through Chester made up as witch with boot polish on my face, I was like a cherry for weeks after that !” Her colleague Bev stuck cornflakes to her face to mimic the girl from The Exorcist (1973). The film was controversial and gave Annie nightmares, so Bev’s costume was very effective. “It was amazing, she scared me!” There were many great times with Bev. One night she believed that aliens were landing on the lawn “she must have taken something!” laughs Annie fondly. Despite this, Annie didn’t encounter the drug scene in Tiffanys. The atmosphere was buzzing and there was no need for any illegal simulation. She worked on all 3 floors and during this time, Ian Rush was a regular clubber. He was playing for Chester City just before he was sold to Liverpool in 1980. She also recalls “having a twinkle” with Liverpool star Jan Molby in Rendezvous (now Rosies)… “our eyes met but nothing happened.. if you fancied them you didn’t have to talk to them!” she says. She recalls that the girlfriend of their doorman Tony Harrison left him for Rush and everyone was suspicious of why she had dumped the good looking Kenny for the soon to be rich and famous footballer. Annie loved the music, especially the Motown hits played on the ground floor. She enjoyed the O Jays, Roxy Music and Rod Stewart. The fashions of the time were silver platform boots, tassels, miniskirts and shaggy permed rock stars. She once wore hot pants with a bib and a rabbit on the front. “ I was a flirt and got a lot of attention”. She remembers a close relationship with a customer called Julian “ I really liked him but I dumped him.. we were introduced by friends and there was an instant attraction, he was tall dark and handsome. He took me to see David Essex in Manchester, it got sorta serious but I still had the party spirit in me and I was torn!” Julian left to work in London refurbishing the Orient Express. “He phoned me up and I dumped him, he sent me a horrible Valentines card” she sighs. He did come back to Tiffanys but I backed off from him after that . Now she rejects the urge to look him up on facebook “what’s gone is gone” she states firmly . Times, fashion and music changed with Margaret Thatcher changing the face of politics. “Thatcher was relevant to me because my dad was a union man.. she got in because the unions had too much power” Recalling the 1983 Miners strike Annie states that “the miners ruined things for the working man. Arthur Scargill was sitting pretty in his big house and the miners didn’t work for 12 months” She recalls the 70s fading into the conflict ridden society of the 80s and things weren’t as rosy in Tiffanys any more. Life was busy going straight from work to the club, finishing there and going back to the pub..”everyone was in the pubs back then”, when every other building in Chester was a pub. People were out socialising and going out more regularly instead of sitting in front of their computers or games consoles for hours on end. 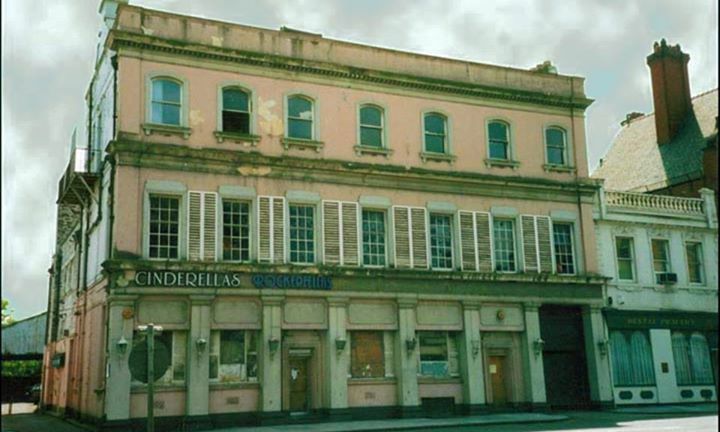 The management of Tiffanys introduced French maid uniforms complete with fish net stockings for the waitresses, and the name of the club was changed to Cinderella Rockerfellas “It became sleazy and I wasn’t totally comfortable with it” and many of the old team were leaving. “ I nearly had a fight with a foreign member of staff who would always grass me up for being late. I was a bit feisty, I whacked a girl with a heavy tray once!” Although Annie had gained in confidence, her drinking was taking its toll. “ A lot of people that work in clubs had issues, we were all one big dysfunctional family. We had our issues and that was our way of dealing with it” The Rendezvous nightclub was making its mark and Annie felt it was time to move on. The years had been great but “it mixed you up, it felt like an unreal environment”. Now engaged to a soldier “it was impossible to balance the club lifestyle with a personal life.. I left to sort my head out, things just weren’t fun any more” She received a locket as a leaving present “I don’t have it now”she says unconcerned. She concentrated on her job at the bookmakers where she remained until 1996. Marriage followed and she spent 5 years as an army wife living in Celle, Germany. When things turned sour she returned to the UK and went through several tough years in tough financial circumstances obtaining a divorce. She was eventually able to return to Chester and in 2001 started working for a major high street retailer. The club was demolished in the 2000s and replaced with bland apartments. Annie’s dentist is right next door to it , “ I walk right past it and hear the ghosts of so many years ago, its cold, like there’s no life there” She feels that the club scene is not the same now, not as friendly as it used to be, walking down a deserted Foregate street at 8pm on a lonely Tuesday night its hard to disagree, one imagines the street alive with pubs that are no longer there, with only the generic charm of McDonalds and Burger King in their place. But Annie remains positive as ever “that time in my life was brilliant! I wouldn’t change any of it. It made me what I am now- the town seemed magical and alive!” The DJ changes the record and life moves on. Hi. The lady who you name as Kathy…. is this Kathy Shepherd.?? If so she went out with my brother for a while, (Dale Holland.) I think Bert was a friend of Kathy’s. But didn’t she work at Blimpers??. Interesting reading…. I was a DJ at Smartyz 1976 for about 3/4 years. The first punk and rock DJ in the club. Those were my fave nights!! Every Monday if I remember rightly? My parents first met in here in 1973. My Dad was on a bar stool of some description, sitting on his own hair (those days have LONG gone) and Mum liked the look of him and offered to buy him a drink! They are about to celebrate 40 years of marriage together. Use to go to cinderella’s back then , had some good times there , also angels which is now the forest house ….